When I had the idea about doing a cakes retrospective for cakelava dating all the way back to our humble beginnings in 2005, little did I know how much effort would be involved with the writing and cake selection process. Was I crazy to think that with well over 1000 cakes in our history it would be easy to choose a representative sampling? Clearly, I didn't think about it, I was driven by the desire to look back and appreciate how far we've come, and to share some cakes we are proud of with new people who may not be familiar with the designs. For 2009, I had an especially tough time choosing cakes to feature so I divided it into three parts. You can read Part 1 and Part 2 if you missed it. Rick designed this beautiful wedding cake with wrapped layers and handcrafted cherry blossoms for an outdoor wedding at Kualoa Ranch in May. The cake was featured in a number of magazines and in the book "1,000 Ideas for Decorating Cupcakes, Cookies & Cakes". The gorgeous photo is by Frank Amodo. 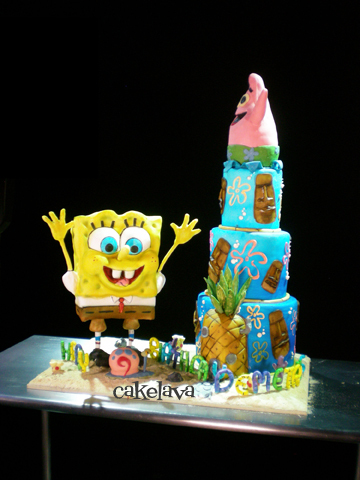 In 2009, a number of our good friends were married and some celebrated significant birthdays with a cakelava cake. 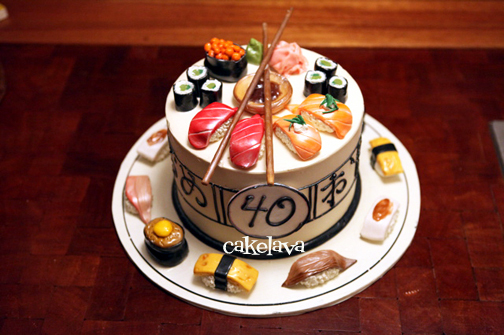 This sushi cake was made by Rick for our friend Melissa for her 40th birthday party and gifted to her by her boyfriend as a surprise. Like us, they are huge fans of sushi. Rick made and placed sushis all over the cake. A few years later, Rick would teach students how to make the sushis on a sculpted platter for one of his classes. This exquisite photo is by Robert Bruce Ayres. 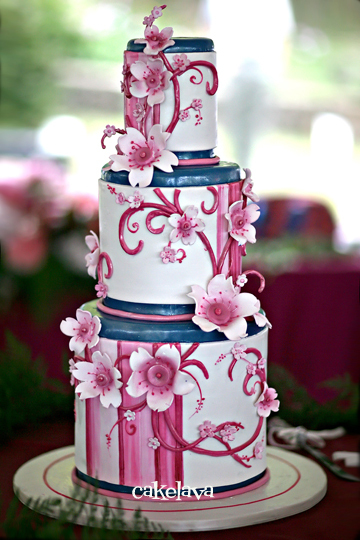 We've adored this cake for years! I like the vintage look of the flowers and bands around the tiers, and the muted tones used throughout. 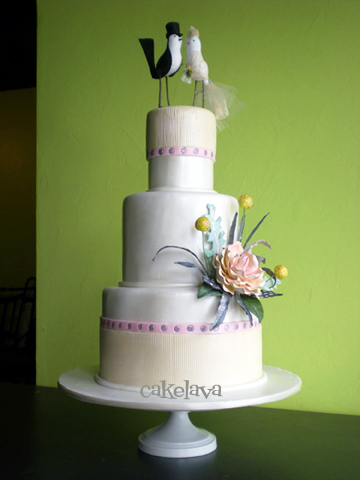 The bride Krista sent us the custom made bird toppers, we thought they were beautifully made and so cute! I wrote a post about this wedding cake back in October 2009 that covers the cake, including the types of flowers, in more detail. It's no secret. 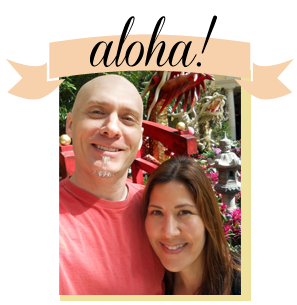 Rick has a great appreciation for Hawaiian tikis and has been including them in his designs for years. I love them too. We even chose "Tiki's Grill & Bar" in Waikiki to have our viewing party for the Food Network "Spongebob" Challenge. 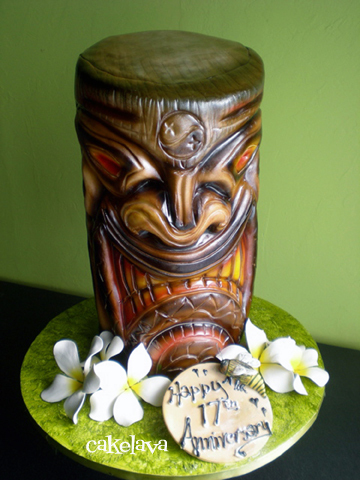 He made this sculpted tiki out of cake for a couple's 17th anniversary celebration. We were both really happy with the way the standing tiki head turned out, and it remains one of our favorites. By the time Rick had made the Tiki cake shown above, we were already in discussions with Food Network for an upcoming "Challenge" TV show they wanted to cast him for. 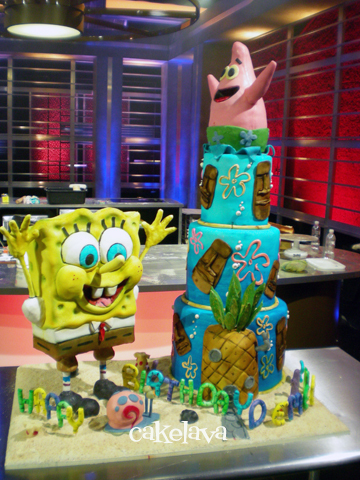 When Rick found out they wanted him for "Spongebob Birthday Cakes", we both just about died! 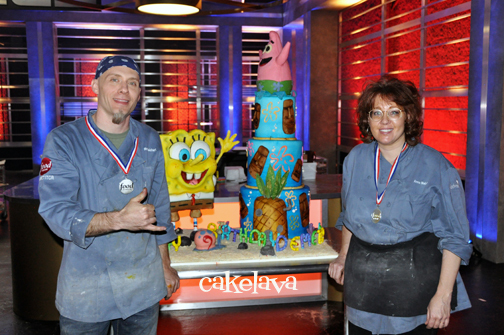 We were so excited for this particular challenge because we are huge fans of Spongebob Squarepants and it was a sculpting challenge - right up Rick's alley! For the competition which would take place in December, the competitors were asssigned one of the characters as their main character. Rick was given Spongebob, which we were both thrilled about! It was his first time on "Challenge" after numerous efforts to try and get out there to do them, and he had to compete against "Challenge" Veterans - Lauren Kitchens, Bronwen Weber and Kristin Davison - which added to the pressure! In an ideal world, we would have uninterrupted time to prepare for such an important competition, but we had too many cake orders to fulfill during that time. Rick had very little time to prepare for his Challenge. He sketched his design, made Spongebob once, secured his assistant, Annie Welch, who he had worked when he was making cakes in Seattle. Once he was cast, we began noticing Spongebob EVERYWHERE, and took trips to Toys 'R Us to look at Spongebob items. Many emails, and forms to sign later, we were on a plane to Denver to shoot the competition! The photo above was taken at the studios where "Challenge" was filmed. The production company had just moved into a brand new studio and we would be one of the first to use it. After a very LONG day with what felt like an equally long deliberation by the judges, including a Nickelodeon representative, the competiton ended and we flew back to Hawaii. Food Network still airs the episode from time to time and I will leave the result of the competition a mystery, in case you haven't seen it. It was a nail biter and a very close competition, and so much fun to watch! Rick and his assistant Annie Welch standing proudly next to their creation! The competition occurred shortly before Christmas and would be aired in April 2010. It was the third longest, most agonizing wait we've had in our cake career, the second being the casting for another Food Network show. The longest wait we've had, well, we are still experiencing it and have been for the past year and a half! 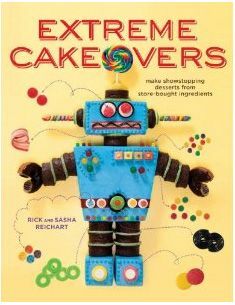 The wait for the Food Network shows was agony, but multiply that intensity by at least ten, adding in excitement we can barely contain, and this is how we feel about the wait for our book, "Extreme Cakeovers". It will finally be released by Clarkson Potter/Random House in July! The next posts will cover 2010, which was another great year for cakes and media, and a turning point for cakelava, leading us down some new avenues. Since our Stroll Down Memory Lane started, a number of you have recognized your cake and it has meant a lot to hear from you! Whether we have made your cake or are just enjoying the view, we would love to hear if you have a favorite cake, or anything else you want to share with us about the cakes. Been fun going down memory lane! So glad I could watch the Challenge at Tikis with you all when it first aired! Can't wait for that book to be released!